70 years on, the future of the North Atlantic Treaty Organization is uncertain. Seventy years ago today (April 4), representatives of a dozen countries gathered in Washington, DC to form the North Atlantic Treaty Organization (NATO). The alliance would commit each member to come to the others’ defense in case of an attack, and reaffirm the values that World War II had so badly damaged: democracy, individual liberty, and the rule of law. In his speech asking the US Senate to ratify the agreement, then-US president Harry Truman said that “the security and welfare of each member of the community depend upon the security and welfare of all.” The original signatories—Belgium, Canada, Denmark, France, Iceland, Italy, Luxembourg, the Netherlands, Norway, Portugal, the United Kingdom, and the United States—were concerned by the aggressive actions of the Soviet Union. Better to counter Russian encroachment in an alliance, Truman thought, than to face it alone. NATO members haven’t always gotten along. The Suez Crisis in the 1950s caused a rift between France and the UK that some argue lingers to this day. In 1966, France’s Charles De Gaulle removed his country’s armed forces from NATO’s integrated military command. But NATO’s future has never been seriously questioned—until the arrival of US president Donald Trump, who has called the alliance “obsolete,” casting the future of US involvement in the group into doubt. That’s not the only way in which the NATO of 2019 looks different to the NATO of 1949. The alliance has grown, and its defense commitments overseas have ebbed and flowed with the pace of conflicts like Kosovo, Afghanistan, and Iraq. NATO’s raison d’être has also changed. It began as a bulwark against Soviet aggression during the Cold War, then shifted its interests after the Sept. 11, 2001 attacks, fighting in Iraq and Afghanistan against the threat of Islamist terrorism. NATO secretary general Jens Stoltenberg yesterday told the US Congress that, going forward, NATO faces “unprecedented challenges,” including a shifting balance of global power, Russian cyberattacks and military buildups, artificial intelligence and innovations in cyberspace, and terrorism. How many members does NATO have? 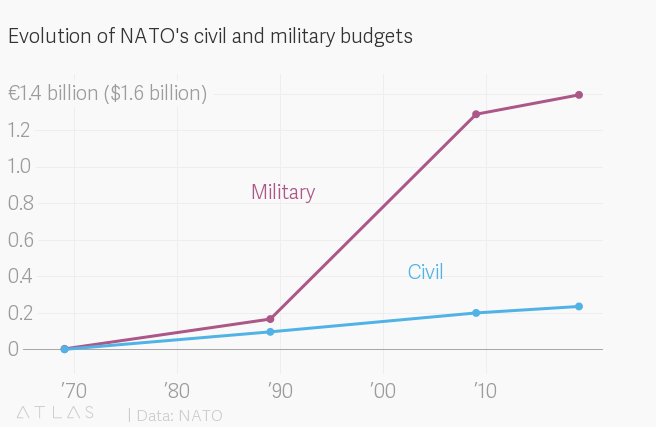 How much money does NATO spend? NATO’s budget is separate from the defense commitments of NATO member countries. The civil and military budgets cover NATO’s operating costs, as well as the costs of the integrated command structure. Members contribute to these budgets based on a formula calculated according to gross national income. The US pays 22% of those costs. 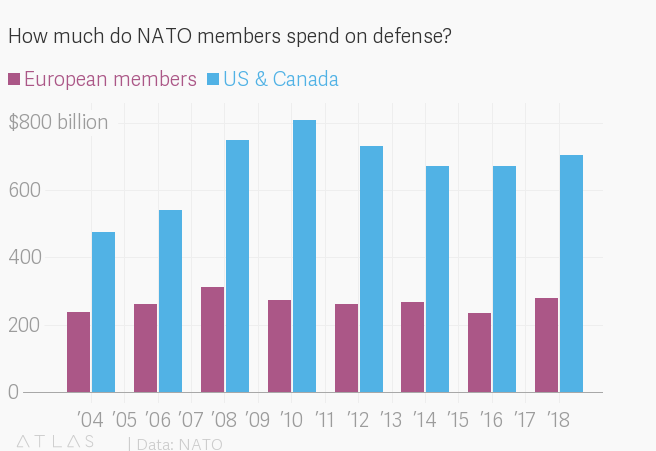 How much money do NATO members spend? 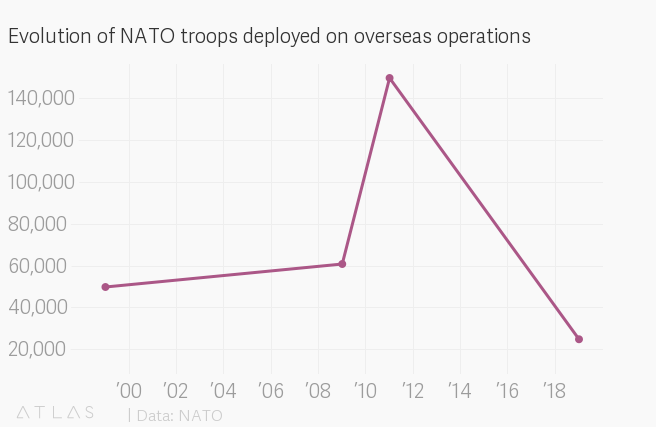 How many troops and personnel does NATO deploy? NATO has approximately 20,000 military personnel currently deployed in operations across the world, including security support in Afghanistan, maritime patrols in the Mediterranean, training in Iraq, and peacekeeping in Kosovo. In 2011, 130,000 troops from 50 NATO and partner nations were deployed in Afghanistan alone. At the end of the Cold War, NATO had 22,000 staff across 33 commands. Today, it has 6,800 staff working in seven “NATO major commands”—permanent, commonly funded headquarters (pdf) in Belgium, the Netherlands, Italy, Turkey, the UK, Germany, and the USA.